Let's be honest. I'm not a big fan of diets or diet books. I'd rather eat a little bit of real ice cream than a quart of low-fat/low-sugar ice cream. I'd rather have a little bit of a good yogurt than a lot of a yogurt that tastes like sadness. But I have no problem with recipes that cut back on calories without making flavor suffer. I have no problem with portion reduction. I have no problem with using lighter ingredients if they don't mess up the recipe. I use Greek yogurt instead of sour cream in a lot of recipes ... unless the recipe really needs sour cream. 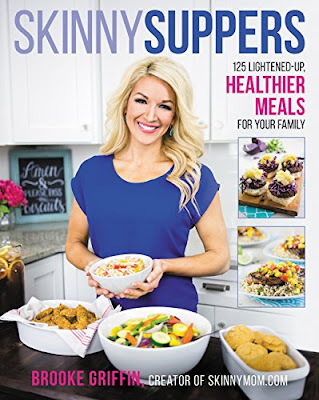 So, when I got Skinny Suppers by Brooke Griffin, the first thing I looked for was any weird ingredients. Recipes in this book sometimes call for light mayonnaise, fat-free milk, or unsweetened jam. I'd probably use regular mayo and milk, because that's what I buy. I do like unsweetened jam, though. But I'm not morally opposed to any of those substitutions. One recipe that called for cream cheese listed 1/3-less-fat cream cheese. That's not too bad. I've used that cream cheese and it works just fine in recipes. I've tried the fat-free cream cheese and disliked it, so I was happy that wasn't required. So that was a fine substitution. I was a little skeptical about sugar-free maple-flavored syrup, though. I'd probably just use less of the real stuff and call it a day. So, the ingredients passed my test - I was either okay with them, or I could substitute if I wanted to. One surprising thing was how many brand names were specified. A pasta recipe, for example, called for Prego Light Smart Traditional pasta sauce. That's helpful as long as that product is for sale, but I thought it might be too specific. Does every store carry this particular sauce? I don't know. Other times, the recipes called for something generic (parmesan cheese) and then mentioned the brand that the author liked (for example, she often mentioned Barilla ProteinPLUS pasta as a favorite). That specificity makes sense for diet recipes, since one brand of pasta sauce might have a lot more added sugar than another. Again, if you like another brand better, it's not going to kill the recipe. The calorie count might not be the same, but a lot of things affect the calorie count. Just how big is a medium onion? The book has an interesting organization. Since it's all suppers, it couldn't be organized in the usual breakfast, appetizer, soup, salad, main ... sort of thing. And it's also not by seasons, as is pretty common these days. Instead, it's beef suppers, casserole suppers, chicken and turkey suppers, pasta suppers, pork suppers, seafood suppers, soups and salads, vegetarian suppers, and side dishes. The edges of the pages in each section are a different color to make it easier to see where sections start and end. The recipes are all things that I'd be happy making, and many of them are things that I already know how to make. But that's fine. I'm always willing to try new versions. Some of the highlights in the book are the apple-stuffed pork tenderloin with Dijon mustard sauce (but I'd leave the raisins out), Italian chickpea salad, butternut squash risotto, slow cooker creamy chicken and wild rice soup, and blackened fish tacos with cilantro-lime slaw. Overall, it's a solid book with recipes that are easy enough to be doable for most folks, but still with a lot of flavor. I doubt most eaters would feel deprived with any of these.